Megan Scime and Surya Makkar. For the fifth consecutive year, The Gerald P. Buccino 1963 Center for Leadership Development at Seton Hall University’s School of Business won first place in the HR.com-sponsored LEAD Awards in the category of Certificate Programs with an Emphasis on Leadership/Organizational Development. Michael Reuter, director of the Buccino Center and a professor of business at Seton Hall, said the center is getting a return on its investment through increased interest in the school. The four-year program matches students with business professionals who provide mentorships. The students tackle assignments on topics such as tax implications of a proposed real estate development and take classes in leadership. 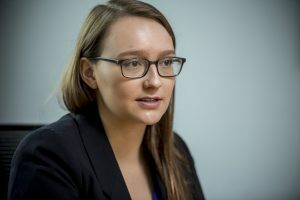 The leadership program’s business focus differentiates it from other programs, Reuter said, in that students are confronting tasks that they will face in business. 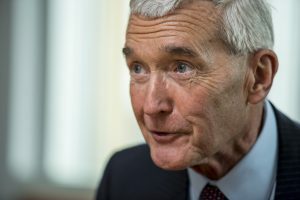 Every graduate of the leadership center during the last seven years has entered their intended careers or enrolled in graduate school or law school, Reuter said. Surya Makkar is a sophomore mathematical finance and information technology major from Springfield. He is taking part in the center for leadership development because he values experiential learning. 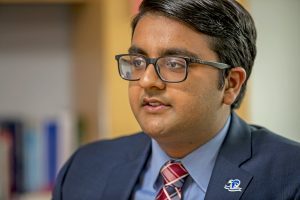 Seton Hall Leadership student Surya Makkar. He considered his Seton Hall classmates in the leadership institute a family from the moment they stepped foot on campus. He is still in contact with Seton Hall graduates as they work in corporate jobs. About 246 Seton Hall students applied to join the Center for Leadership Development, Reuter said. Forty-six students were offered spots and 23 accepted. Taylor Cutcliff is a senior from Springfield, Pa. majoring in mathematical finance. She expected to be challenged but was still taken aback by her assignments. During her freshman year, Cutcliff was majoring in biology pursuing the physical therapy track. Cutcliff recalled being a sophomore walking into the freshman 101 leadership class and being confident in her abilities. “But I was completely taken out of my comfort zone,” she said. 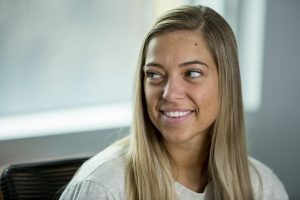 She conferred with Reuter about feeling not equipped to succeed in the program, but Reuter encouraged her to persevere and she followed his advice. Seton Hall Leadership student Megan Scime. Megan Scime is a junior from Niagara Falls, N.Y. majoring in marketing and political science. Before choosing to enroll at Seton Hall, she was looking for a college that would enable her to grow beyond academics. Scime learned from many people starting in her freshmen year and benefitted from networking. “You have got to get comfortable talking with anyone in any setting,” Scime said. Madison Schuchart is a junior from Mechanicsburg, Pa. majoring in marketing and information technology. As a high school senior, Schuchart visited Seton Hall and met Reuter and was struck by his passion for supporting students to achieve more than they expect to achieve. “To have someone like him supporting you throughout your whole four years really means a lot,” Schuchart said. Her greatest challenge in the leadership program is meeting with business executives and learning to be professional. Seton Hall Leadership student Madison Schuchart. The leadership institute is based on seven pillars of leadership development: character, civic engagement, change management, ceaselessness, collaboration, conflict management and courageous communication. The institute honors 1963 Seton Hall alumnus Gerald Buccino, founder of Buccino & Associates Inc, a financial advisory and business turnaround firm. Seton Hall’s Stillman School of Business started the Buccino Center for Leadership Development in 1996. 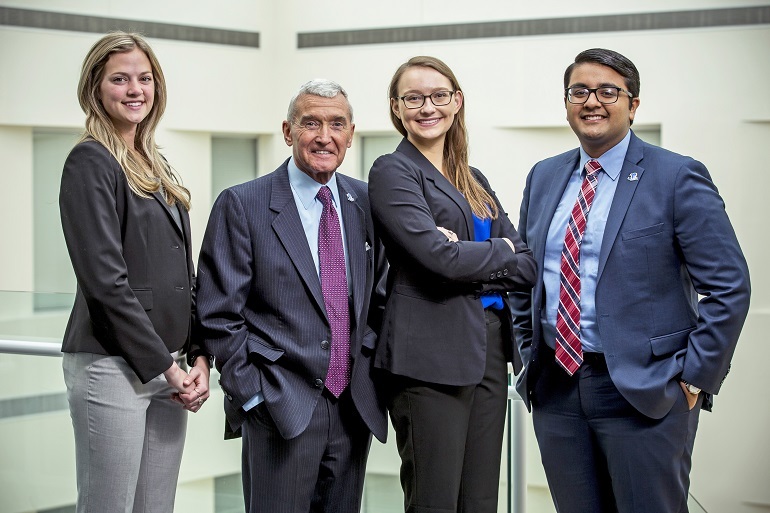 The Buccino Leadership Institute was created by the university in 2018 as an interdisciplinary undergraduate leadership program based on the Buccino Center’s success. Seton Hall beat teams from the University of Iowa, Florida International University, Pennsylvania State University, and Pepperdine University in the 2018 competition, according to Reuter.